So, you know the CARE Center, right? You probably know that it is located on the second floor of Heggblade, above the Dean of Students Office. You might know that part of its mission is "to build capacity in communicating across difference with respect and civility." But here's something you probably don't know about the CARE Center: it exists because of the activism of a small group of students of color, which began in February 2015. 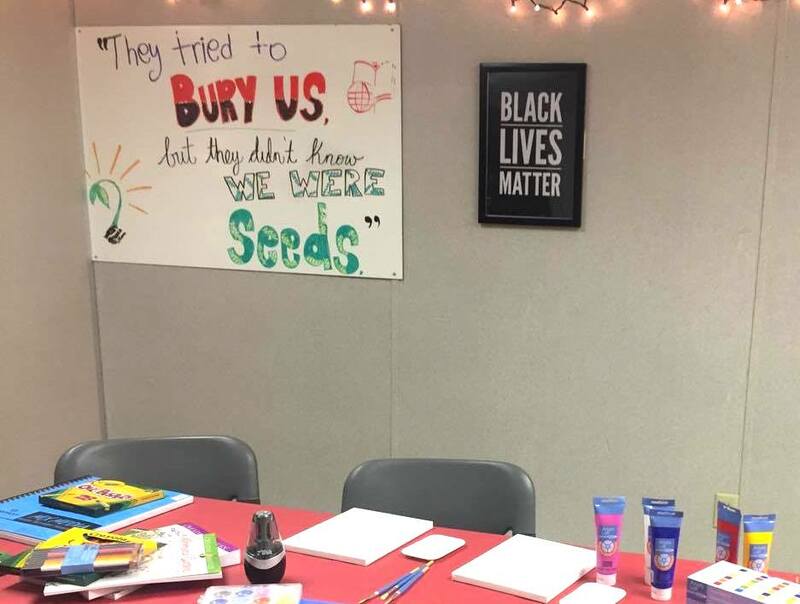 These students, who formed a group called CMCers of Color, met with administrators throughout the Spring and Summer of 2015 advocating for — among other things — a campus resource center for students of marginalized identities. Even at the end of that summer, when the administration went back on their agreement to create a resource center, students refused to give up and CMCers of Color continued to grow in size, partnering with other affinity groups, such as BSA, APAM, SAGA, and GenU. Collectively, they signed and published a letter detailing instances of racist, classist, and homophobic aggressions on campus, which highlighted the lack of institutional support and called for increased resources for marginalized students. The letter was followed by a demonstration at the Hub, where students shared their experiences and list of demands. At this time, President Chodosh agreed to set up a temporary and eventually permanent space for the resource center. At the end of the 2015 fall semester, students gained access to one of the portable offices next to Bauer Center, Module G, as the temporary resource center. Early in the Spring 2016 semester, four students, including myself, were hired to direct programming for Mod G and help shape the permanent resource center. Mod G showed us a glimpse of what a vibrant, student-centered resource center could look and feel like. We filled a bookshelf with diverse, empowering narratives ranging from Amy Tan’s The Joy Luck Club to Assata, the autobiography of Assata Shakur. We hung art and posters with messages like, “A woman’s place is in the struggle,” “Black Lives Matter,” and “Queers Demand Gender Self-Determination.” We went to Ikea and picked out a coffee table, a rug, and other decorations. We planned a successful open house event where students, staff, and administrators wrote out their commitments to create an inclusive campus culture. We held office hours every week and welcomed all students into the space. We did our homework there and sometimes took naps on the couches. Because this was before a Dean of Diversity & Inclusion was hired, we did all of this without a direct supervisor. Together, we, the students, filled that tiny portable office with love and — yes — abundant care. But the care with which we nurtured our community in that space is not the same care from which our current resource center derives its name. How could it be when the first letter of the acronym CARE stands for "Civility”? The mission statement for the CARE Center contains the words "civil" or "civility" three times in the first paragraph, while the words "racism," "marginalized," and "students of color" are nowhere to be found. Enshrining civility as the primary value of this space dismisses the range of emotions that come with being a marginalized student at a place like CMC and tells them "you will be excluded from the discourse because the way you express yourself makes some people uncomfortable." Note that this tone polices students of color, which is irrefutably harmful because it values the comfort of the privileged over the feelings and lived experiences of the marginalized. In bending over backward to emphasize that the space is open to all, it becomes unclear why the space even exists in the first place. The majority of CMC students don’t need a space like this because the entire campus is a safe space for them. This space should be for the minority of students who experience marginalization, discrimination, and microaggressions on campus and who need a space that makes them feel a little less alone in what can otherwise be a very isolating college experience. Frankly, I don’t care if “all” students feel comfortable in the CARE Center. I care that the students who the space was created for feel comfortable there. I care about all the students who feel like they don’t belong at CMC having one place on campus that centers and uplifts them. Moving forward, the CARE Center can better support students by properly acknowledging the history of resistance and student activism that led to its creation. The CARE Center must also de-emphasize civility and instead elevate its original intended mission: to support and empower students of marginalized identities. The CARE Center must offer better support for identity-based groups on campus (including dedicating permanent physical space within the center to each affinity group). This space must prioritize the needs and support of marginalized students above the comfort of more privileged students. This space must help students develop a critical consciousness around race, class, gender, power, and privilege and encourage them to think critically about their intersecting identities. This space must empower and support student activists, not ignore, silence, or tone police them. The CARE Center is here because of the students of color who fought for it, who sacrificed so much knowing they would likely never see the fruits of their labor, but believed it was worth it to give future marginalized students a better college experience. Though the space is not what we hoped it would be, it is a step in the right direction that it exists at all. If student activism taught me anything, it is how incredibly powerful our voices are when we raise them together to demand equity and justice. I have faith that current and future students will be able to reclaim this space and shape it into something that radically centers them and serves their needs. There are many ways to do this, but I think it must start with remembering the history of how it came to be.